For a long time, I have believed that F1 should be run by the teams rather than a bunch of failed lawyers and stuffed shirts calling themselves the FIA. Now it seems that I was wrong. The FIA has asked the newly-formed association of team owners called FOTA for their suggestions regarding the future of F1 and Martin Whitmarsh, the head of FOTA's sporting working group, has spoken about one of their ideas. In brief, this amounts to turning the Friday practice sessions into a primitive time trial with the cars running on hard tires and a million bucks as the prize. Words fail me. If this is the best FOTA can come up with when looking to the future, the last thing we want is to have them running the sport. Ignoring the question of why the sporting group should concern itself with matters of entertainment, what on earth makes Whitmarsh think his silly time trial (yes, Luca, it seems F1 is a circus after all) will draw any more viewers than does the present practice session? A better idea would be to have the pit girls put on a show of cheerleading while the drivers compete in sack races and apple dunking. I can’t think of anything particularly good, perhaps because "change Friday practice" is a long way down the list of "stuff that needs fixing in F1"?. Consistent stewarding? Clear rules? Better engagement with the fans? Improved racing? More teams? All far more important matters. If FOTA is going to duck the more important issues and prioritise unimportant stuff like this then they aren’t going to be much use. It is time that F1 realized that the GP is the show and that is what the viewers come for. Never mind the sport adapting itself to suit the demands of entertainment; it is exciting and spectacular enough to have captured the attention of millions worldwide and changing things merely to "spice it up" only detracts from the main event. Let the media work out fresh ways to present it - that is their job (and my suggestion concentrates on that rather than calling for change in the sport). We are looking at the whole format of a race weekend. At the moment we formulated a Friday testing format, but in reality no one is doing the normal disciplined testing. We are preparing for the race (instead). If you give a race team the chance to go on the race track where they are going to race at on the Sunday on the Friday before, then we must have been nuts to think that we will be doing engineering testing. So we are all as bad as one another. So we say, is this good value? Does it help the show? The first assumption, that Friday is for testing, is obviously incorrect. The sessions are called "practice", this surely indicating that the idea is for teams to prepare for the GP. Naturally the teams are going to be focused upon the upcoming race and will need time to set their cars up for the circuit - even Whitmarsh admits that this is what happens. Where he gets the notion that practice sessions are for testing, I do not know. There are several testing sessions in between GPs each year and it seems to me that this would be the appropriate place to do such things. Any team that has left testing until the Friday before a GP is running late and likely to be in deep trouble as a result. 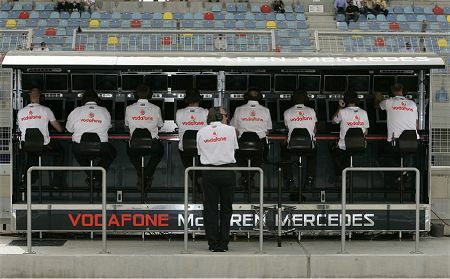 It is not as if the teams do not need the practice sessions either. Older teams may have a mountain of data on previous races at each circuit but differences in weather and surfaces can render that useless. Perhaps he feels that McLaren could cope if forced to rely on previous data alone, but I think their funding advantage over many other teams is such that they should not be given yet another benefit over the minnows. Contrary to what Whitmarsh seems to be implying, the Friday practice sessions are an important part of the GP. Apart from the fact that they allow teams time to find their ideal set up, they also pinpoint aspects of the circuit that may cause problems in the race (the pit entry and exit at Singapore is an example) and they let rookie drivers begin to learn the track. If we must consider the entertainment side of things (and I do not believe that should be the concern of F1), let the TV broadcasters work on it. It is their show after all and they are supposed to be the experts in the field. If there is a problem, it is in how things are presented, not in the practice session itself. Were the media allowed greater freedom and access, I am quite sure that they would produce something that would draw in the viewers. That might require that Mr Whitmarsh be much more open about what really happens within McLaren but, judging by events over the last couple of years, secrecy has brought the team nothing but trouble. Never mind the wacky races, Mr Whitmarsh; let the show come to F1 rather than F1 go to the show! My thoughts exactly. This is meant to be a sport, not a circus. But if Whitmarsh is looking for ideas, how about letting the fans wander around the paddock in the evening after qualifying, and get up close to the cars? To me this sounds like an ecomist who thinks he can control the supply side and the demand side will follow. The potential F1 audience works on Fridays. It doesn't matter how good the show is because there will never be more than a fraction of the target audience available to watch it. I think Whitmarsh is spending too much time with the FIA and it is affecting his thinking. Patrick: Certainly that idea has to be a strong attraction for those able to attend the event and it makes sense to re-introduce it. My idea is along similar lines but caters to the TV audience instead: let one team per Friday allow a TV crew full access to their pit and motor home, with entry to team meetings, interviews with drivers and personnel (including such lowly creatures as the mechanics) all aspects of the team, in fact. This would allow the public to gain a much greater insight into the workings of a F1 team, what it takes to win, why so many are employed, etc., and this would have a knock-on effect in making it easier for fans to understand the race itself. Steven: I know very little about Martin Whitmarsh apart from the fact he is Ron Dennis' chosen successor. On this evidence, Ron has made an inexplicable choice - but perhaps we should be generous and suppose that it is an idea thrashed out by all the team principles on the Sporting Group, Whitmarsh merely being their mouthpiece. But this would mean that they are all guilty of such a pointless suggestion and we would have to doubt the foresight of team managers in general. Perhaps it is a case of never letting the "experts" decide their own parameters, since they live in a little world of their own and have no grasp of the real world outside. Or maybe the pernicious influence of the FIA is much more powerful than we realised, as you suggest. Whatever the reason, it seems that I was wrong to put so much hope in FOTA and I should look elsewhere for any saviour of the sport. I hope this was said with the same tongue in cheek as the rally lights on the Singapore McLaren. Fridays Mosley and Ecclestone should rent a local auditorium to explain the previous week or two's outlandish rulings! In the evenings they should have an open question period. At the end of the year they can spend some of their extorted cash on therapy. Well, if this is the place to come up with outlandish ideas, i would like to make some input. Why not put a timer on every car, and have it locking the steering wheel in place for two seconds every five minutes. That would surely give some spectacle, only problem is it would cost both drivers and cars. What the heck was they thinking, coming up with an idea as that one? What is needed is better racing, and fairer and faster judgment during the races. It should not take more than one or two replays to see whats wrong and what punishment should be suitable. Just look at Red Bull Air races, even though their stints are just around one minute long, the judges are done when the planes cross the finishline. And let's not forget to nag on about the aerodynamics, the less we have of that, the closer the racing will get. We definitely need faster decisions. Sunday showed that there is a serious stewarding. Problem. 2 drivers enetered the pits when they were closed. Open and shut case - instant decision. Instead of telling Rosberg and Kubica to pit on the first flying lap after the safety car they waited so long that Rosberg came out in fourth place. His eventual podium position was entirely due to the incompetence of the stewards. Leave things alone is all. Statements like this actually scare me because in certain sports they actually begin to take them seriously and say 'hey, lets try that'. Now I'm not bashing the sport I'm about to mention, but it is an example of entertainment overkill where the main event is overshadowed by flair. 2 years ago I went to an NBA basketball game and was shocked at what went on. Before the game, loud music, contests, light shows, cheerleaders, and anything to get the fans wound up with this 'entertainment overkill'. Don't let the event become secondary to entertainment please. Clive,if you fancy a laugh check out Red Bulls excuse why Webber`s car tried to select two gears at once,that must of been a mighty large tram. Come to think of it, that might make more sense for increasing Friday entertainment than the idea FOTA have had. Seriously, Friday doesn't need improving. For those of us who watch it, the sessions are great fun (especially for those lucky enough to get an online feed to augment the live blogging and live timing). It's the other bits that are the problem. I think this whole episode shows F1's attitude to its fans - it cares nothing for those it has and looks only for new ones. Clearly, Bernie and Whitmarsh would be happy to dump us for idiots who know nothing of the sport and only want to see thrills and spills. And one can understand why; fans who know a thing or two can object to the way the sport is being mangled in order to make more and more money, whereas circus audiences don't care as long as there is plenty to make them ooh and ahh. I suppose I should not be surprised that even the team managers want to make more money but it is a bitter disillusionment for me. I agree completely with BMWF1guy - if it ain't broke, don't fix it. He runs a good blog (just been to have a look) and supports the right team! Take a gander if you have the time.